This book explains one of the hottest topics in wireless and electronic devices community, namely the wireless communication at mmWave frequencies, especially at the 60 GHz ISM band. It provides the reader with knowledge and techniques for mmWave antenna design, evaluation, antenna and chip packaging. Dr Duixian Liu, Yorktown Hights, US is a researcher at IBM at Thomas J. Watson Research Center since April 1996. His research interests are antenna design, electromagnetic modeling, digital signal processing, and communications technology. He received the IBM's outstanding technical achievement awards in 2001 and 2002, and the IBM's highest technical award, in 2003, for contributions to the integrated antenna subsystems for laptop computers. Dr Ullrich Pfeiffer, Siegen, Germany is the head of the THz imaging group at the Institute of High-Frequency and Quantum Electronics at the University of Siegen, Germany. From 2001 to 2006 he was with the IBM T.J. Watson Research Center where his research involved RF circuit design, power amplifier design at 60 GHz and 77 GHz, high-frequency modeling and packaging for millimeter-wave communication systems. He is a member of the German Physical Society (DPG), and was the recipient of the 2004 and 2006 Lewis Winner Award for Outstanding Paper at the IEEE International Solid-State Circuit Conference. He received the European Young Investigator Award in 2006. Dr Brian Gaucher, Yorktown Hights, US is a research staff member at the IBM T.J. Watson Research Center where he manages a communication system design and characterization group. His present research interests include 60 GHz Gbps wireless communication design and biomedical applications of wireless technology. His group has helped more than five products come to market. He is an IBM master inventor and holds two outstanding technical achievement awards and one corporate award. 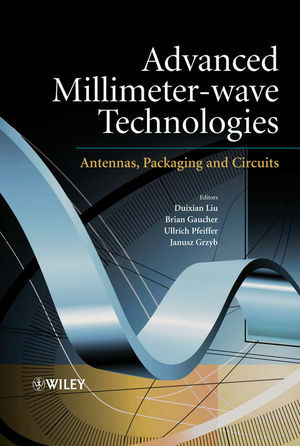 Chapter 2: mmWave Packaging (Pfeiffer). Chapter 3: Dielectric Properties at mmWave and THz Bands (Dougherty, Lanagan, Rajab). Chapter 4: mmWave Interconnects (Grzyb). Chapter 5: Printed millimeter antennas – Multilayer technologies (Mohamed, Lafond). Chapter 6: Planar Waveguide-Type Slot Arrays (Ando, Hirokawa). Chapter 7: Antenna Design for 60 GHz Packaging Applications (Liu). Chapter 8: Monolithic Integrated Antennas (Öjefors, Rydberg). Chapter 9: Metamaterial for Antenna Applications (Itoh, Lai, Lee). Chapter 10: EBG Materials and Antennas (Weily, Esselle, Bird). Chapter 11: System to Circuit and Technology Implementation of RF and mmWave Switches (Plouchar). Chapter 12: MEMS Switches (Hoivik). Chapter 13: Phased Arrays (Pao, Aguirre). Chapter 14: Integrated Phased Array (Hajimiri). Chapter 15: mmWave/THz Imaging (Luhmann, Yang, Shen). Chapter 16: Millimeter-Wave System Overview (Reynolds). Chapter 17: Special MMW Measurement Techniques (Zwick, Pfeiffer).